Solar office building in China. China is often dubbed as a heavy user of fossil fuels and polluter or a climate killer. Because it meets the 70% of its power needs by exploiting coals. But they are making changes on the environment front too. Slowly and steadily they are choosing wind and solar power as their source of energy. China has earned the distinction of having the world’s largest solar-powered building. It is situated in Dezhou, Shangdong Province in northwest China. The building covers an area of 75,000-square-meter. The office building is modelled after the sun dial structure. The building provides many services such as space for exhibition centers, scientific research facilities, meeting and training facilities and a sustainable hotel. This building is named as the Sun and the Moon Altar micro-row buildings. The architecture included the Chinese characters for sun and moon. The solar building has a white exterior that represents clean energy. The clean and green ideas are not confined to the massive solar array only but can be spotted in the whole building complex. They have utilized only 1% of steel to the Bird’s nest. Their advanced roof and wall insulation system consume 30% less energy than the national energy saving standard. The building will be showcased to the whole world during the 4th World Solar City Congress. The building’s pioneering solar energy and power-saving technologies, a few already patented, include a number of technical advancements that will push forward the mass application of solar energy. The building will procure 95% of its energy needs from alternative energy sources. They have installed a 5000 square meter solar panel array on the building complex. This building also has the facilities of solar hot water, a solar desalination plant and a solar energy theme park. Dezhou can safely be termed as a solar city because among 5.5 million people living in this city most of them opted for the solar hot water systems. In this city, solar energy is all pervasive. It powers everything from street lighting to tourist cars. Greenpeace put forth some statistics for this city. According to them, in 2007, 800,000 people in Dezhou had jobs in the solar panel industry. Greenpeace predicts that this figure is expected to grow to 1,500,000 by 2020. Forget the discouraging climate talks in Copenhagen and the difficulties in replacing fossil fuels with biofuel on airplanes. In Zurich, about 75 engineers and technicians have spent the past six years pursuing the dream of zero emissions by building a plane solely fuelled by solar power. The prototype of the propeller driven airplane, HB-SIA, completed its runway test at Dubendorf Airfield, a military airport in Zurich, earlier this month. Although the plane only flew about 350 metres at an altitude of one metre, the engineers and technicians appeared gleeful when it landed gracefully on the centre of the runway. Bertrand Piccard, the chairman of Solar Impulse and co-founder of the privately funded project, raced to embrace the pilot. The short flight was a milestone for the project. The next test flight will take place in spring, between Dubendorf and Payeren, another military airport in Switzerland, to find out more about the airplane’s flying capabilities. A second HB-SIA is scheduled to fly around the globe in five legs as early as 2012. Piccard, a Lausanne-born aeronaut, first came up with the idea of flying a solar-powered plane in 2003. He says people told him it was an insane idea. He was unable to find any funding for this €70 million (HK$782.8 million) project during the first year he pitched it. But the spirit of adventure runs in the family. Piccard’s grandfather, a pioneer balloonist, set altitude records in his pressurised gondola and later invented a deep-sea submersible that set depth records. Piccard said he began thinking about how to make a breakthrough in the field after launching the first non-stop round-the-world balloon ride in 1999. “I should do something to reform transport in modern history,” he said. The idea of the solar-powered airplane came after a failed attempt to fly an aircraft around the world, in which he ran out of fuel. Piccard decided to create an aircraft that did not need to carry fuel. The first to respond with help for Solar Impulse was Semper, a Geneva-based private asset management company, followed by others including Altran, Omega, Deutsche Bank and Toyota. About €40 million of the investment money has been secured from private companies and individual donations at present, mainly from Europe. In a bid to take the message to the other side of the world, Piccard has visited the mainland three times over the past year. “We are hopeful that more mainland companies will support us,” he said. “For example, we’re hoping Suntech [a mainland solar energy company] will provide us with the solar cells,” Piccard said. There has been no sponsorship from the mainland so far. Still, he is confident that the remaining funds can be raised easily. One of the few remaining problems to be addressed in the prototype before the round-the-world trip takes place is how to upgrade the cockpit with a business-class seat from an economy seat at present. Three pilots, each flying alone, will complete the five legs of the trip in a total of 20 days. Each will spend at least four days in the cockpit. The seat designer must mitigate the pain and fatigue on the pilots by making the seat as comfortable as possible, given the extreme physical and psychological demands on the pilots during the trip. Unlike racers, who can boost their endurance with energy drinks, Piccard said these would be forbidden in his round-the-world flight. “Since we have to stay in the cockpit for four to five days in a row, we would like to keep our mind calm,” said Piccard, who has a background in hypnosis. Meditation and hypnosis are techniques Piccard and his fellow pilots will apply during the trip. Still, it will be difficult to stay awake for four to five days. To deal with that, a vibrating jacket was designed for the pilots that will wake them if their position changes to an odd angle. Flying the solar-powered plane in the dark is another challenge. In the round-the-world trip, the plane should be capable of flying in the absence of light for 14 hours, Piccard said. That means the 12,000 solar cells attached to the wings and the fuselage of the plane should be able to store energy for at least 14 hours. The wingspan of the HB-SIA is as wide as an Airbus 340; however, its weight is just about that of a car – 1,600 kilograms. The plane is designed to fly up to a maximum altitude of 8,500 kilometres, with an average speed of 70 km per hour, on the power equivalent of that needed to light up all the bulbs on a large Christmas tree. The 20-day expedition in 2012 is scheduled to begin between May and July as it is the period when the earth enjoys the longest period of sunlight. Three pilots, including Piccard, Markus Scherdel, the test pilot and Andre Borschberg, the co-founder of Solar Impulse, will take turns on the trip. Divided into five legs, HB-SIA will start in Europe and stop over in the United Arab Emirates, the mainland, Hawaii and the United States before completing the loop. One of the key technologies in the project is the carbon fibre needed for the fuselage. Over the past five years, the Solar Impulse technology team has cut the weight of the material in half. 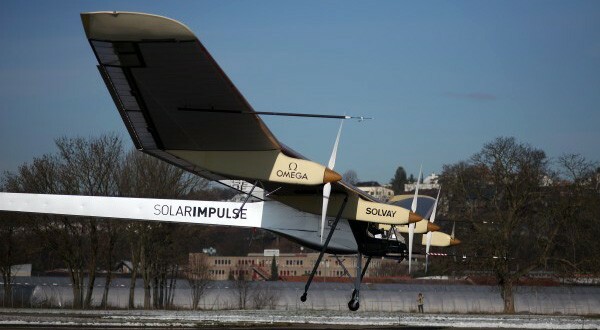 After 6 years, Solar Impulse prototype passes first test with global flight planned for 2012. Can CLP help us by setting up new green traget? The failure of the Copenhagen climate summit to cut a deal to tackle rising temperatures effectively is a sad indictment of leaders’ claims to be taking the matter seriously. In the absence of a unified effort, governments have to implement their own targets and rules to reduce the carbon emissions that are causing global warming. The chief of Hong Kong’s biggest electricity producer and single largest polluter is right to say the lack of a legally binding treaty is a “real shame” and big disappointment. He should be going a step further by pairing his rhetoric with policies that make his company a shining example for others to follow. CLP Holdings has a target of a 75 per cent cut in carbon intensity by 2050. It aims to have 20 per cent of its power generated from renewable and nuclear sources by 2020. Goals need to be set and met to fight climate change. They could be considerably more ambitious than those put in place by CLP. Emissions from the power plants operated by CLP and Hong Kong’s other electricity supplier, Hongkong Electric Holdings, account for the majority of our city’s carbon emissions. Both firms are public companies with shareholders’ interests to protect. But the pollution that comes from the smokestacks of their plants affects the well-being of all citizens. They have to make every possible effort to keep pollution levels as low as possible. Generating electricity by burning the most polluting fossil fuel of all, coal – as happens at present – is not in Hong Kong’s interests. Power bills are kept low, but the grey pall that hangs overhead threatens and harms our health. Our city’s image is lessened in the eyes of tourists and businesses wanting to locate here or expand. Alternatives should be used as soon as possible, even at a higher cost. Both electricity providers are making an effort. In CLP’s case, sights are set on new nuclear reactors in Guangdong to complement cleaner energy being produced at its jointly owned plant at Daya Bay. More than 10 per cent of the power coming from its stations across the region is generated from renewable sources other than nuclear – up from 1 per cent five years ago. More gas and oil are being used instead of coal. As the unambitious targets indicate, though, greater effort is needed. The government drives Hong Kong’s policies to cut carbon emissions. It has not set targets, which are of debatable value in the context of a city that has a small area and is prone to the effects of regional pollution. Officials have a poor track record in environmental protection. Their lack of a popular mandate to govern has made them reluctant to implement laws that affect the companies that contribute to bulging coffers. Authorities need to be pushed into tougher pollution-cutting policies. CLP is perfectly placed to take the lead. By setting an example through taking bigger strides to clean up its operations, it will send a loud and clear message to the government and community. Electricity charges will most likely be raised, but the cost is worth bearing for the sake of the improvements that will follow. CLP Power (SEHK: 0002) was yesterday given government approval to raise its tariff by 2.6 per cent next year, including the basic tariff, which was adjusted for the first time in 10 years. But Hongkong Electric (SEHK: 0006)’s charges for next year will be frozen. The approved increase for more than two million power users in Kowloon and the New Territories triggered fears that it would push up inflation, and raise more questions on the future cost of clean energy. From January 1 CLP Power’s charge per kilowatt hour will be 91.5 HK cents – 2.3 cents, or 2.6 per cent, higher than the existing 89.2 cents. The increase includes a 2.6 cent rise in the basic tariff, which is partly offset by a fall in the fuel charge of 0.3 cents made possible by stable prices over the past year. It means more than 70 per cent of domestic and commercial users will see monthly increases of less than HK$10 and HK$40, respectively. CLP Power attributed the basic tariff increase to a rise in capital investment on emissions controls, and provision of a replacement gas supply, along with a rise in the cost of raw materials such as copper and aluminium. “We are seeing in 2010 a slightly higher level of capital expenditure compounded by higher material costs,” Richard Lancaster, CLP Power’s chief operating officer, told the economic development panel yesterday. Lancaster said emissions control projects must be carried out to meet licence requirements, and new gas supplies had to be made ready by 2012 before the existing source from Hainan ran out. The company is working on a desulphurisation project, and planning new pipelines from Shenzhen to receive natural gas from Central Asia and a LNG terminal. The company also has to provide about HK$5 billion for power supply infrastructure at new developments such as in Kai Tak. Lancaster said it was the first time in 10 years that the firm had raised its basic tariff, and the new net tariff would still be lower than last year’s level. Environment secretary Edward Yau Tang-wah said yesterday that while anti-pollution measures at power plants were necessary, they were not the only reasons behind the tariff rise. He said emissions control accounted for less than a third of the total capital spending of CLP Power, with about a half being spent on power transmission and distribution to new developments. Hongkong Electric will freeze its tariff at 119.9 cents per kilowatt hour, without changes to either the basic rate or fuel charge. “We hope this will help the economic recovery of Hong Kong, and minimise the impact on the public,” Tso Kai-sum, its group managing director, said. However, Tso warned that the company was still under pressure to increase charges, because it had to double its gas use for power generation to 600,000 tonnes next year, and gas was about three times dearer than coal. A person familiar with the negotiations between the government and the power firms said both companies had originally proposed raising their tariffs by 3-5 per cent. The person said Hongkong Electric would have a greater deficit in its fuel account next year as it expanded its gas intake. Concerns have been expressed over the cost of increasing gas-fired electricity generation to a half in Hong Kong to improve air quality or mitigate climate change. Hongkong Electric said it needed to build more gas-fired units for this, while CLP Power said that its newly sourced gas supply from the mainland would be more expensive than what it was currently paying. 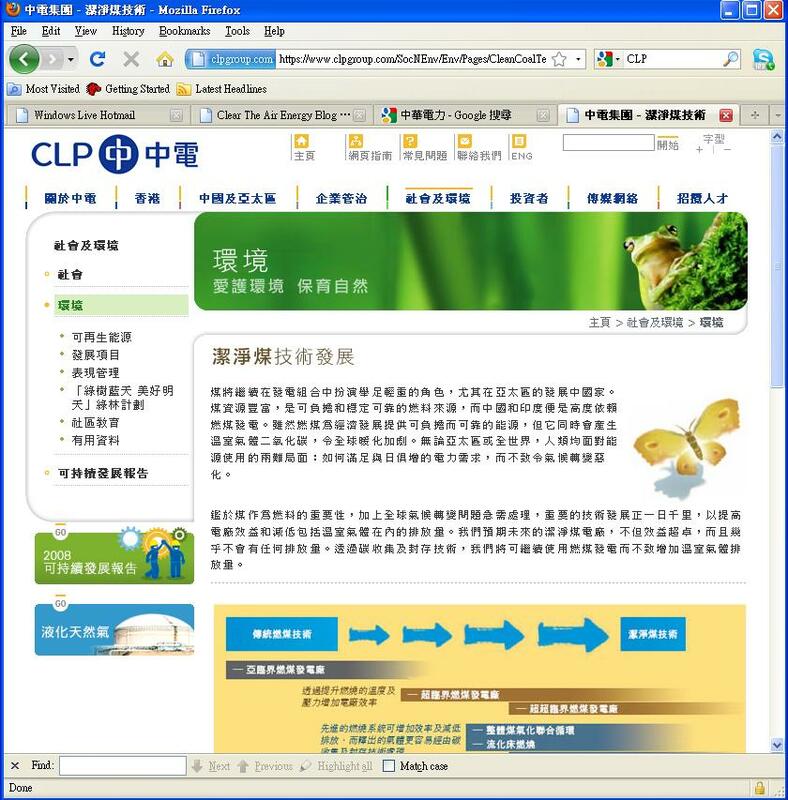 Meanwhile, legislator Lee Cheuk-yan criticised CLP Power for ignoring the financial difficulties low-income groups faced. “This is likely to trigger a chain of price increases and the poor, who have not had any pay rises in recent years, are the hardest hit,” the unionist said. Miriam Lau Kin-yee of the Liberal Party queried if it was justifiable for power firms to pass on all capital spending to consumers. please see the self explanatory information herewith. If this anti pollution system works well in China and reduces dangerous suspended particles then it should also work here. Exxon Mobil has one test unit installed at Castle Peak but is hesitant to spend more money for all their boilers whilst delaying the issue of test reports to the public on the efficacy of the unit. Meanwhile they have Alstrom here looking at how they can redesign these coal fired systems to use gas. We see this as a delaying tactic to save their valuable pennies – meanwhile Hong Kong pollution continues to increase. Clear the Air says ‘Delay No More’ to CLP and HK Electric. From what we can see , Indigo is the Best Current Available Technology and our power companies should be made to fit it by the imposition of WHO Air quality standards which they must meet – they will need this technology to meet those standards.